Photo credit – Double Red. Fully-restored ex-works machine is estimated to realise between £110,000 and £130,000 at the Bonhams auction at the International Classic MotorCycle Show in Stafford, UK, on Sunday 28th April. 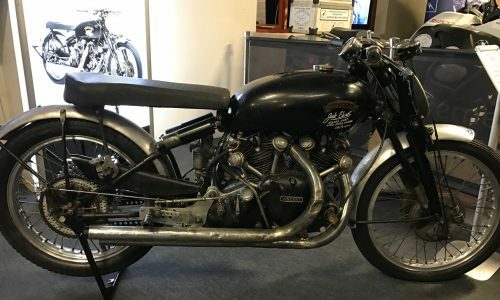 A Vincent Black Shadow motorcycle that formed part of a bid by the factory to set a new 24-hour speed record in 1952 is among £1 million worth of lots already consigned for the annual Bonhams sale at the International Classic MotorCycle Show in Stafford, UK, on Sunday 28th April. Although mechanical failures prevented the bid at Montlhéry in France in May 1952 from being successful, the British team returned home with eight new records, including six hours at over 100mph. The fully-restored, matching-numbers machine has been owned by the current vendor for more than 40 years and is offered with a pre-sale estimate of £110,000 to £130,000. Among other machines consigned to the Bonhams sale of Pioneer, Vintage and Collectors’ Motorcycles and Related Memorabilia are a trio of Brough motorcycles – two from a single owner collection. A 1931 SS80 that started life as a sidecar outfit with Ipswich Police before being converted to solo trim and raffled off to raise money for the Brough Superior Club is estimated at upwards of £50,000. Tickets for the 1972 raffle were sold for five pence each, or 50 pence for a book of 10, and second and third prizes respectively were 10 and five gallons of oil. The lucky winner sold the machine to a club member who raced it for several years, before it passed to its current owner in 2004. A 1926 SS80/100 model estimated to realise between £160,000 and £200,000 is a rare factory variant combining an SS100 frame with the SS80 sidevalve engine. Only a handful of these unusual machines were made, of which very few survive. Re-engined post-World War II with an overhead-valve SS100 unit, it won the ‘Re-build of the Year’ award at the Brough Superior Club’s Annual Rally in 2012. The Brough family is also represented by the 1921 Brough Model G. This rare motorcycle was manufactured by George Brough’s father William, whose company was in existence from 1902 to 1925. Offered for restoration, it is estimated to realise between £20,000 and £30,000. Other British motorcycles of note include a rare factory-restored 1957 Ariel Square Four 4G Mk2 (estimate £12,000 – £14,000). 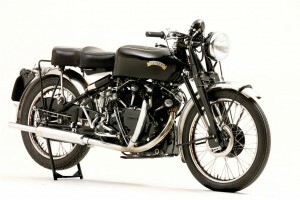 Britain’s major motorcycle manufacturers did not routinely offer a restoration service to their customers, preferring to delegate such tasks to local agents. This machine’s late owner John Hay, deputy news editor of The Financial Times, bought it in 1962 and succeeded in persuading the factory to restore it for him, despite the fact that the ‘Squariel’ had been out of production for three years. The machine remained with him until his death, passing to the current owner in 2011. The sale will also feature the earliest known Velocette Viper – a 1955 model that originally formed part of the factory’s press fleet – (estimate £8,000-12,000), a restored 1949 Vincent Rapide – one of an estimated 107 touring models shipped to the US finished in ‘Chinese Red’ – (estimate £50,000 – £70,000), a 1988 Norton Classic rotary – number ‘51’ of the 100 built – that has covered only 1,500 miles from new (estimate £8,000 – £10,000), and a 1961 BSA DBD34 Gold Star Scrambler with only 11 miles recorded since restoration (estimate £9,000 – £11,000). Collectable foreign classics on offer include a 1972 Laverda 750SFC production racer (estimate £30,000 – £34,000), a c.1979 Yamaha TZ750 Formula 750 racing motorcycle (estimate £30,000 – £34,000), a 1982 Yamaha TZ500J Grand Prix racing motorcycle (estimate £32,000 – £36,000), and the unique 2001 MV Agusta 952cc F4 factory prototype that competed in that year’s World Endurance Championship (estimate £20,000 – £26,000). No Bonhams spring Stafford sale would be complete without a fine selection of early motorcycles, and the sale this year will feature a 1914 Excelsior Model 7C v-twin (estimate £35,000 – £45,000), a 1913 Rex v-twin (estimate £18,000 – £22,000), a 1905 Peugeot v-twin (estimate £18,000 – £22,000), and 1924 Rudge 4-valve/4-speed model (estimate £6,000 – £8,000). Ben Walker, Head of the Bonhams Motorcycle Department, said: “We are very much looking forward to the first UK sale of the year at the International Classic MotorCycle Show. It has been an excellent start to 2013 for the department, which recorded its most successful sale in Las Vegas in January and more than doubled its previous sale total in Paris earlier this month. The Endurance Championship for classic bikes is a fact!